As an online merchant, making your first sale is as symbolic as it is necessary. The Internet is packed with influential bloggers, journalists, entrepreneurs, and vloggers from a wide range of industries and niches. Many of them have large followings on social media and loyal audiences on their websites. Sending a free sample of your product to such influencers, who are either within your industry or related to it in some way, gives you an opportunity to let them know you appreciate their work with a small gift. Also, hopefully, you will get a mention on one of their sites or platforms. Not only will this provide you with a spike in traffic and social media followers, but you’ll also have a seal of approval from industry experts. These influencers will provide you with measurable results following a potential share or shout out, and you’ll likely raise the status of your product in the eyes of potential customers. A useful resource regarding influencers is KISSmetrics’s definitive guide to influencer targeting, which tells you everything you need to know about getting your brand under relevant, important noses. If you aren’t already running a blog associated with your store or product, then you’re missing out on the limitless potential of content marketing. By producing free, valuable content, you will create trust in your brand and keep people informed. Blogging also gives you something to share on social media and helps you rank in search engines. A simple yet highly effective way to get started with content marketing for your business is to think of all the starting-point queries people have about your products and industry. Using your blog, you can answer these queries as individual articles. Additionally, you can use your blog to offer tips, tutorials, and resources related to your products and the lifestyle around your products. If you can create epic content on a fairly regular basis, you’ll begin to see the power of content marketing via social media shares, search engines, and so forth. All of this is covered under KISSmetrics’s guide to content marketing. In fact, according to research by MarketingSherpa, 60% of marketers polled found that email marketing produced an ROI for their company (32% believe it will eventually produce an ROI). When asked what the estimated ROI from email marketing programs for the company were - the overall group reported 119% - a figure that’s tough for any online store owner to ignore. If you need some more advice on how to get started, KISSmetrics offers the perfect beginner’s guide to email marketing. In some cases, sponsoring an event can work wonders. In other cases, it can be an immense waste of time and resources. To avoid the latter, you’ll need to do your research. First, you should ensure that you select the right event to sponsor. Search for events where attendees actually will be interested in your products, and then find out how many consumers will be in attendance. Once you get a rough idea about the different event types and sizes, you can begin sorting them by cost. It’s also important to avoid sending just a small convoy of marketers to simply set up a table and hand out flyers. If there are potential customers attending, you’ll need to be more creative than that in order to build relationships. Demonstrate some of your most interesting products to tell your story, get people talking, and provide on-the-spot rewards like coupons and free stickers in return for email list subscriptions and social media follows. Here are some tips from Inc to help you maximize your return when sponsoring an event. Remember the importance of content marketing I mentioned earlier? Well, interviewing an industry influencer is a prime example of how to create epic content. Interviews work because they are win-win situations. The interviewee gets more exposure, while the interviewer gets their hands on some hot content for their publication, which in this case, is your blog. A great example of this is 500px’s interview with Elena Shumilova. As a popular name in the world of photography, her interview made perfect content for the online photo vendor. If you want that first sale fast, pulling a PR stunt could do the trick. Much like viral videos, which are based on the same concept, a PR stunt has the potential to propel your brand into fame. If executed well, you’ll be swapping conventional time-consuming brand marketing with instant publicity, gaining you loyal followers and customers in the process. Essentially, a PR stunt consists of doing something unusual, outrageous, hilarious, or remarkable enough to be worthy of media attention. If done correctly, your store could benefit from tons of links from authority news sources, which is great for both traffic in the short term and SEO in the long term. No company pulls a better PR stunt than Virgin. Their founder, Richard Branson, has dressed up like a wedding bride, jumped off a casino roof, posed as a zulu warrior, driven a tank down Fifth Avenue in NYC, and flown a balloon around the world, among many other newsworthy things. To get your creative juices flowing, take a look at Entrepreneur’s list of top 10 successful marketing stunts. They’ve covered everything from outrageous tattoos to left-handed burgers. Remember, a good PR stunt doesn’t require tons of cash or a big brand to pull it off. It just requires creativity. AdWords is Google’s hugely popular pay-per-click advertising network that allows online retailers to place advertisements on nearly every Google search results page, YouTube video, and partner website. 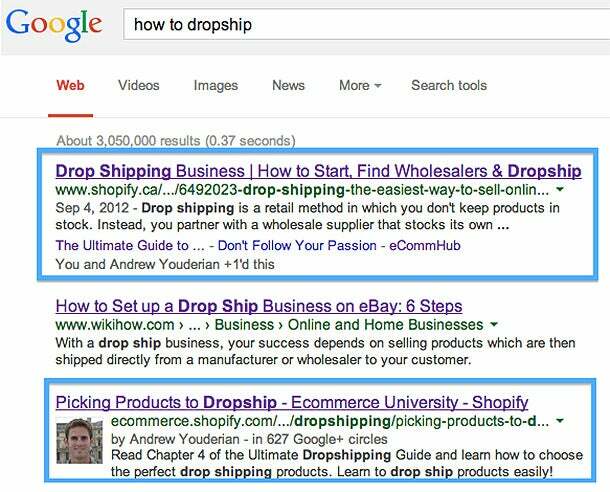 Who wouldn’t want to rank in the top three of a search query that drives sales? 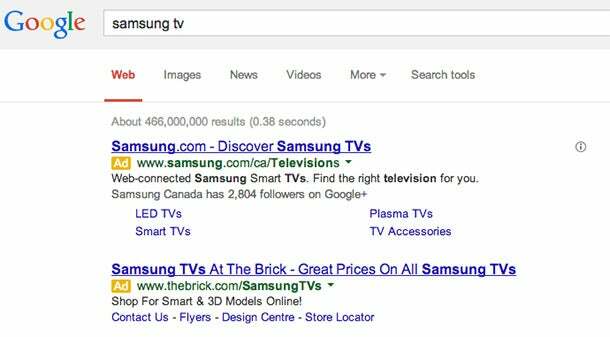 Here’s what shows up when you type “Samsung TV” into Google. Note that the first result is a paid ad from Samsung. The beauty of AdWords lies in its speed and massive reach. In as little as a few minutes, you can set up and launch an advertising campaign which gets your text, image, or even video ads seen by browsers all over the web. Using the AdWords campaign options, you can create targeted ads which are triggered and displayed alongside Google searches when Internet browsers search for predefined keywords. Additionally, your ads also will appear on websites and articles which contain similar keywords. To get started with your advertising campaigns, check out The Next Web’s informative Google AdWords beginner’s guide, where you’ll learn how to build and launch a successful AdWords campaign. Trying to sell your products alone can be a difficult task, so why not share the load with others? Affiliate marketing is when you let other people market your products and send you website traffic. In return, you pay them a percentage of any sales that originate from their efforts. Their marketing efforts can be kept track of by giving them unique hyperlinks (which they can post on their website) containing an ID code at the end of the link, just for them. For example, a website owner may post your affiliate link for a blue sweater that is for sale on your website. If one of his website visitors clicks the link and then buys the blue sweater, you’ll have made a sale, and as an affiliate, the website owner will be entitled to a percentage of that sale. The success of affiliate marketing schemes depends greatly on the types of products you sell, as well as the commission percentage you reward your affiliate partner. To get started, check out this explanatory affiliate marketing guide from QuickSprout, which goes into great detail about the different facts, figures, and methods you’ll need to know. One of the main advantages of selling wholesale is the obvious increase in cash flow. You may be selling with a finer profit margin, but you’ll be shifting products in quantity. For a crash course on the basics of selling wholesale, check out Entrepreneur’s guide to starting a wholesale distribution business. Lots of new online stores push out press releases in order to attract media attention, but fail. It goes without saying that to get ignored by every single news outlet when distributing a new press release is demoralizing and often a huge waste of resources. The secret to getting noticed is simple. Don’t publish a lousy press release!!! First of all, make sure your news actually is news worthy. Don’t expect a massive response unless you’re giving the public something seriously interesting to read about. Also, a press release should be presented in a way that is concise and professional, without being too monotonous. Copyblogger has pieced together six ways to write a killer press release, explaining everything from avoiding jargon to creating a magnetic headline. Reviewing and acting upon website analytics is paramount. The behavior of every website visitor from entry to exit helps you understand why you are selling, and more importantly, why you aren’t. Your website stats (or analytics) will show you what your customers are doing on your site, including which web pages they enter, the time they spend on particular pages, and the route they take to leave your site. Occasionally, some tools will display additional information, for instance how frequently a customer visits your site. It won’t cost you a penny, either. Google Analytics is a completely free service, allowing you to measure your traffic in more ways than you can think of. Here’s an example from Miracle Berry. You can see steady traffic up until early January when there is a huge jump. They looked at their data and saw that the jump came from StumbleUpon, which could be a good indicator that the social channel is worth pursuing further, either organically or via paid placement. After you launch your online store and while you’re fighting for your first sale, it’s extremely important to spend time analyzing your traffic in Google Analytics. You never know what you’re going to learn. If you need a hand getting a grip on the world of analytics, Simply Business offers a comprehensive Google Analytics guide, covering everything you need to know. Learning about the common pain points and desires of consumers can help you make all the right moves going forward. Consumer surveys are an ideal tool for obtaining honest feedback. Unlike your friends and family, consumers have no qualms about hurting your feelings by picking at your web design or your marketing material. To run your very own survey, you can make use of online apps like Survey Monkey and Qualaroo to create online surveys. Econsultancy has picked up on some important practices to be used when conducting e-commerce consumer surveys, which can help you get the most out of your feedback. Online discussion forums are great places to give out industry tips and advice, answer questions, and acquire a customer or two. Use Google to search out some active forums that may directly relate to your niche. When you post, ensure you aren’t breaking any forum rules when you promote your brand or products. Get to know the limits and restrictions of the forum, and stick to them. Using your forum avatar, signature, and profile page to promote your brand are usually well within the rules. You may feel the temptation to post and promote wildly, but keep it professional. No forum will tolerate constant promotion or posts full of links to your website. Bedsides, acting in such a way online will damage your brand in the eyes of other forum users. So, keep it simple by posting just enough for people to notice your activity, but not enough to constitute spam. Two popular business focused forums worth getting active on are Digital Point and Warrior Forum, both of which have thriving, helpful communities. Sometimes it’s nice to have some support. A small online cartel could be just the trick. Find a group of complementary (but not competitive) retailers and agree to promote and support each other. It’s a brilliantly simple way to gain traction in a variety of ways. For example, if you run an online clothing store, ideal cartel candidates might include jewelry and footwear outlets. Essentially, the stores you would partner with are similar enough to be able to cross-promote and share advice, but not similar enough to create a conflict of interest. You can opt for a completely private setup, keeping things small and tight-knit, or you can branch out and publicize your online cartel in order to attract more members to help build a supportive community of online merchants. Take The ecommerce Group for example. Operating via a Facebook group, they have over 2,500 members sharing advice, giving feedback, and providing a helping hand whenever possible. It’s not what you know, it’s who you know. Building the right relationships, both online and offline, can act as your portal to success. No matter what type of product you sell or which industry you work within, there always are like-minded businesses out there, and you need to befriend them. For example, suppliers, blogs, and websites that focus on your industry would be ideal, as they can help provide you with consumer feedback and offer promotional deals, without stepping on your digital toes. To learn more about how to build a positive relationship with your supplier, All Business offers a great relationship building tutorial. Everybody loves free stuff, and if you’re looking to build up some trust while launching your sales efforts, a contest or giveaway could help you do just that. Not only can contests and giveaways help you build valuable inbound links, they also are a great way to show potential customers that you can be trusted and that your brand means business. It’s important to remember you don’t have to start big. 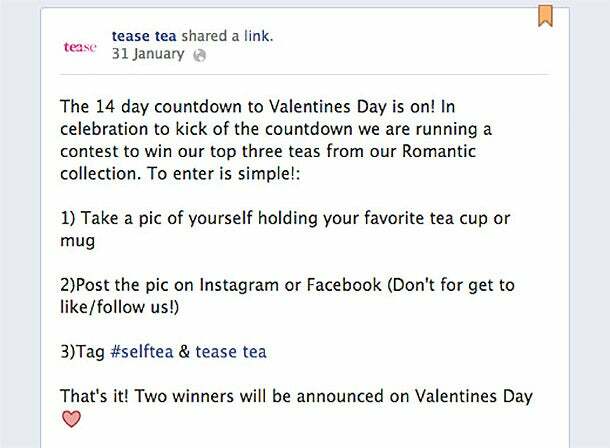 Tease Tea is a new online tea store running a simple contest on their Facebook page. Online services like ViralSweep and Gleam allow you to run such contests and giveaways online, helping you to keep things simple and professional without all the added work. The idea is not to pitch or even mention your products - just be helpful. For example, when Gary Vaynerchuk was running Wine Library, he would search “Chardonnay” on Twitter and find people asking related questions. All he did was offer advice; he never pitched. As a result, people would be grateful and naturally look further into who he was, and ultimately discover his business on their own. This is just one of many Twitter strategies that can work wonders for your sales figures. If you need some real life examples of how to nail Twitter marketing, take a look at the Twitter profile of online jewelry store Lola Rose, which could teach you a thing or two. After you set up your e-commerce business profile, you can begin doing the same for yourself (if you haven’t already). You may not make many direct sales through LinkedIn, but you’ll discover an array of opportunities with other companies, suppliers, related websites, and more. LinkedIn Groups also are a stellar way to engage with other business owners in your industry. There are vast amounts of public and private groups set up for specific niches, allowing you to post questions and converse with other members. To find some relevant Groups, check out Practical Ecommerce’s top ten LinkedIn Groups for ecommerce. When it comes to representing personality and creativity via social media, the three big visual platforms do it best. Pinterest, Instagram, and most recently Vine, all allow you to take a slightly different approach to engaging with consumers. These platforms are the perfect place to present the creativity and passion that goes into your business behind the scenes. Snap pictures of your products, take videos of the manufacturing process, tell a story with images. Always aim for beauty if possible. People love beauty. Need some visual inspiration? 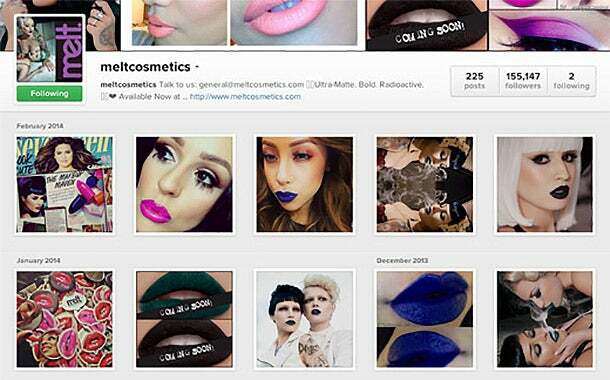 Melt Cosmetics is a new brand that already has over 150,000 followers on Instagram. They are doing a great job of Instagram marketing, building up a brand image and a following with their beautiful photographs. It may not be what it once was, but make no mistake, Facebook still is a social media powerhouse. Leverage your personal Facebook profile and your business page to engage with friends, family, and acquaintances and to get people talking about your products. Get creative with status updates and interact on public groups and fan pages relevant to your niche. It’s also important to keep Facebook Ads in mind. Much like with AdWords, you can create targeted campaigns to attract Likes, make sales, and promote your brand. A popular blow drying salon in Toronto called Drybar has an extremely engaged Facebook community of over 80,000 who talk all things blow drying. If you’re fresh out of ideas for your Facebook business page, check out Shopify’s ten ways ecommerce brands can increase traffic and sales with Facebook. Many, if not all, consumers like to shop around before making a purchase, and that includes a visit to comparison shopping engines. Popular engines include The Find, Google Shopping, Nextag, and a range of others, all with thousands of products and stores being simultaneously compared. 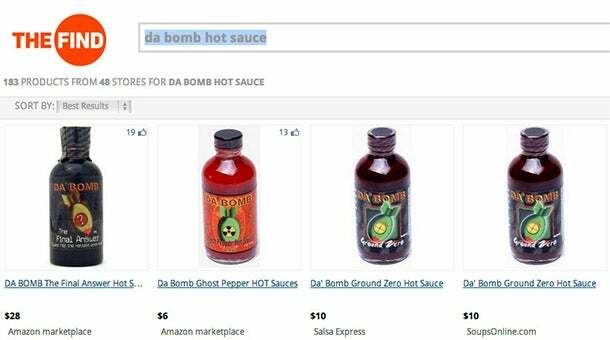 Here’s an example from The Find where I’m searching for a price comparison on my favorite hot sauce. To get noticed, you need to play by the rules of each engine, stay competitive in terms of price, and play the waiting game while you experiment to find out which engine suits you the best and gives you the best ROI. An infographic is exactly what the name implies, a graph of information, or a visual representation of facts and statistics in a form that is easy to digest. Although they aren’t entirely easy to create, infographics are gold when it comes to social shares and search engine traffic. In fact, according to UnBounce, which has created an inspiring and detailed guide to marketing with infographics, people are searching for infographics like you wouldn’t believe, with Google seeing an 800% increase in such searches in the last two years. If you aren’t a visual genius, there’s no need to worry, plenty of firms like Column Five Media offer infographic creation services, leaving you to focus on content. First impressions are everything, and when it comes to selling online, first impressions rely heavily on web design. Based entirely on your website design, visitors need to be able to grasp your brand and products without too much scrolling or exploring. Furthermore, navigating through your catalog should be easy, if not enjoyable. Additionally, making your store responsive to mobile devices is nothing short of vital. Perhaps more so than having a website built for standard PCs and Laptops.Internet Retailer recently reported that 55% of all online shopping occurred via mobile devices in June 2013 compared with just 45% from desktops and laptops. We’re seeing similar numbers with our stores at Shopify. So, looking the part on all devices is an absolute must. To get some creative ideas about your own store’s design, have a look at Smashing Magazine’s list of 35 beautiful ecommerce websites and Inspired Magazine’s roundup of 40 stunning online stores. Just because your store began online, it doesn’t mean it has to stay online. A pop-up store could be just what you need to compliment your online presence. Unlike traditional bricks-and-mortar premises, a pop-up store is far less of a financial burden, thanks to its temporary nature. Like most kinds of physical stores, a pop-up store is all about location. You can open a pop-up store at farmers markets, art fairs, shopping malls, galleries, and any other place people gather. Just make sure you’re set up in an area that is clearly visible and where your target market will be wandering. A pop-up store also can act as a great offline marketing outpost. You can use your store to hand out coupons to be used via your online store, and you can collect email subscriptions and social media followers. For some ideas on how to get your pop-up store going, Business Insider has compiled no less than eighteen creative pop-up store ideas to get you thinking. Reddit is a socially powered news and entertainment website where registered users submit content. Also, and more importantly, Reddit is a place where you can attract a large number of dedicated followers and customers. Using the r/entrepreneur subreddit in particular, you can introduce your brand, gain feedback from consumers, and learn lessons, while also promoting your own products. The process has to be one of give and take, though. Walk those entrepreneurial redditors through your journey, take them behind the scenes, detail your mistakes and expose some personality in order to gain not just customers, but fans, too. A brilliant example of using Reddit to promote an online store is what the guys at Beardbrand did. The beard grooming specialists documented their launch on the r/entrepreneur subreddit, deriving valuable advice from subscribers and customers, while giving back to them via regular updates and inside information. Here’s the founder posting an update to the r/entrepreneur community. Note how many upvotes and comments this post received. Reddit can be an extremely powerful tool, not only for gaining valuable educational resources to help you start your business, but also for helping you make your first sale. The 25 strategies listed above are stellar ways to kick-start sales for your online store. Also, check out a guide I wrote with Sean Work of KISSmetrics titled 50 Ways to Make Your First Sale. It’s a free, in-depth guide on how new online entrepreneurs can make their first sale. With the right approach, you will need only a handful of the strategies listed above to make the first of many sales.